Because it’s nearly 11 PM and I cannot think of another introduction, today can be summed up in a few words: clouds, wall, view, and food. After breakfast, we yet again dragged our bags down a few flights of stairs. Our task was not over as we then walked for around 15 minutes to pier with 40 pounds of luggage. We proceeded to wait by the dock for 25 minutes in the wind and slight drizzle for the boat. Surprisingly, the wait was not too bad. We boarded the ferry and departed Korčula for Dubrovnik. On the ferry, many of us engaged in various activities to entertain ourselves and stay busy. For example, I journaled and worked on my final essay while Meghan and Iman fell asleep. After two hours, we were finally in Dubrovnik. For the first few hours, the city seemed gloomy to all of us. It was cloudy and we experienced light rain while walking around. Because our rooms were not yet ready, we dropped off our bags at the hotel and left for the Old Town. To enter the Old Town, we had to walk through the stone wall crossing over from modern Europe to medieval Europe. In the wise words of Meghan, “it was like Disney World.” To elaborate, the Old Town was full of beautiful old buildings and an endless amount of tourists enough to give anyone slight claustrophobia. Luckily, we left the main street and ventured up the wall. After many pictures, we walked back down into the town which had become far less crowded than before. We then reunited with the group and made our way to the cable car to take us to the highest point in Dubrovnik and most likely surrounding areas. There, we took plenty of photos and enjoyed the amazing view. After that, we went to a nearby museum (still on the mountain top) to learn more about Dubrovnik during the War. What interested me the most was not the actions Dubrovnik took during the War, but how it was portrayed in the museum. While Bosnian memorials were still nationalistic, they generally portrayed Bosnia as a defender or victimized country. The Croatian museum today was more aggressive in how they presented themselves. The museum generally referred to Serbia or Montenegro as ‘the aggressors’ and often described Croatia or Dubrovnik as ‘heroic’. This museum made me realize that narrative is extremely important in telling a story and can completely shape a person’s opinion depending how well the narrative is crafted. Following the museum, we went back down to the Old Town for dinner in the square and later left the Old Town to return back to our hotel. There, we had our debriefing activity and watched the Croatia-Iceland World Cup game. Fortunately, Croatia won 2-1. Upon the Croatian victory, we went to our rooms and called it a day. Today was a day of much needed relaxation. We started off this morning with a nice breakfast in the hotel, enjoying the beautiful view of the Adriatic Sea from our seats. After we finished eating, it was time to start working on our final pieces of writing for the trip. We brainstormed, discussed and began to write. We worked for about 3 hours, before heading off for a much needed break. We head down to the beach for the first time, the water crystal clear and inviting. One by one we entered the water, which was cold and refreshing, though some of us needed more encouragement then others. The water was very salty, and we were able to float with ease as we enjoyed our escape from the heat. After lying on the beach and drying off for a bit, we went off to lunch. After lunch, we head back to our hotel to take showers, and then proceeded to write for 2 more hours (what fun!). After we finished this momentous task, we head down to the marina to be picked up for dinner. On the way there, the driver and his son were fascinated by Mason’s skill with the Rubik’s Cube, with the child trying it out himself, him and Mason having found a way to communicate without a common language. 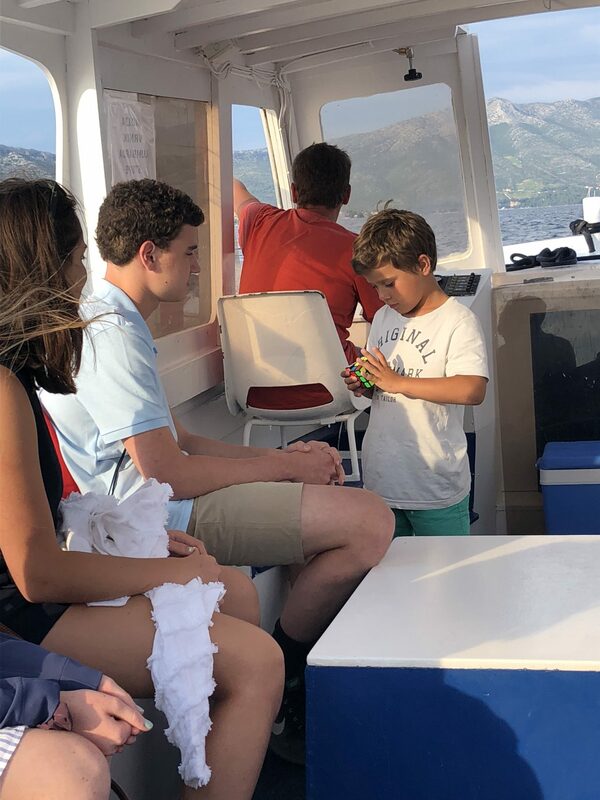 Mason teaching the boat driver’s son how to use the Rubick’s Cube. For dinner, we had an (actual) Croatian meal called “peka.” The meal consisted of meat cooked under a bell for several hours, and it was delicious. The most interesting part of our day took place during dinner. It turned out that all of the waiters were from Mostar, and one came over and asked Adam what parts of Mostar we were in. After Adam explained where we were, the waiter began to question him about the exact details of our location, and we realized that he was trying to find out where in the divided city we had been. Our waiter – a Catholic who identified as a ethnic Croat – was born in Mostar and told us about his Croatian passport. 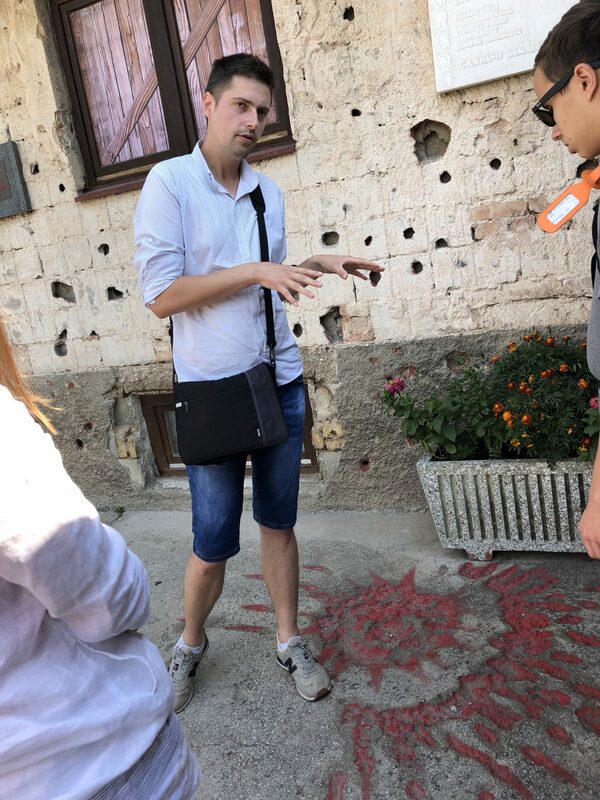 He began to say how people lied about what really happened in Mostar, that the Wikipedia pages told different stories of what went down depending on the language you read it in; he even showed Adam a document that he said was proof the Bosniaks really blew up the Old Bridge. While our group was on our walk, he showed one of Adam’s friends alleged video evidence for an hour. This waiter was the first example of strong nationalistic pride we had come across face to face, and showed that some of our most important learning moments happen unexpectedly. After our big meal, we decided to explore the island a bit. We started to move towards a monastery that was hundreds of years old. During the 50s, it had been turned into a sports center by the Yugoslav government, and it was only given back in the 00s. We walked through the sports center for a bit, seeing how nature had taken back the once-used basketball court and mini golf course. We walked a loop around the monastery, before heading back to the boat to return to Korčula. We walked around the city for a little while, and then walked back to our hotel to get a good night’s sleep. Monastery near our dinner location. By James R. Photos by Dr. Jones. The first thing that we did today was wake up at 7:15 and carry our luggage down four flights of stairs. Yup, about as fun as it sounds. We quickly discovered that it was well worth it, though. 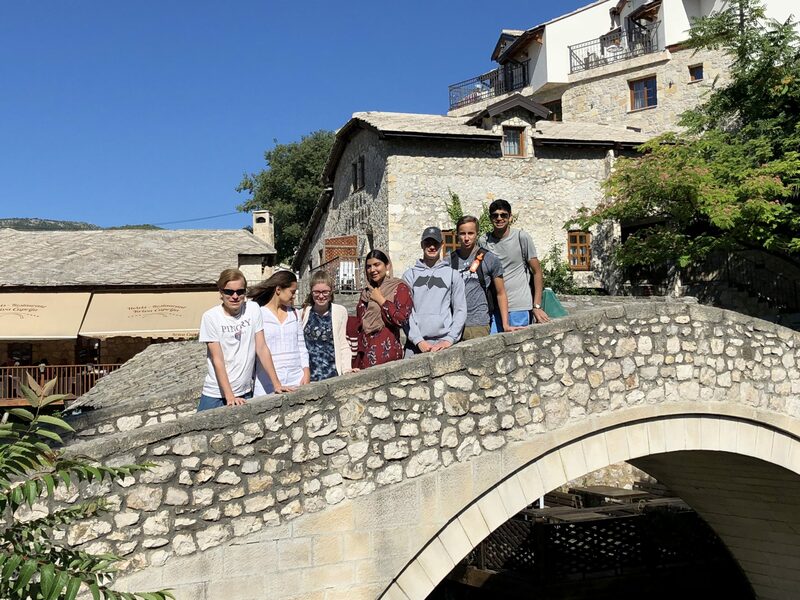 As we went on a final walk through Mostar, we talked about the sights that we had seen there and the people that we had spoken to. 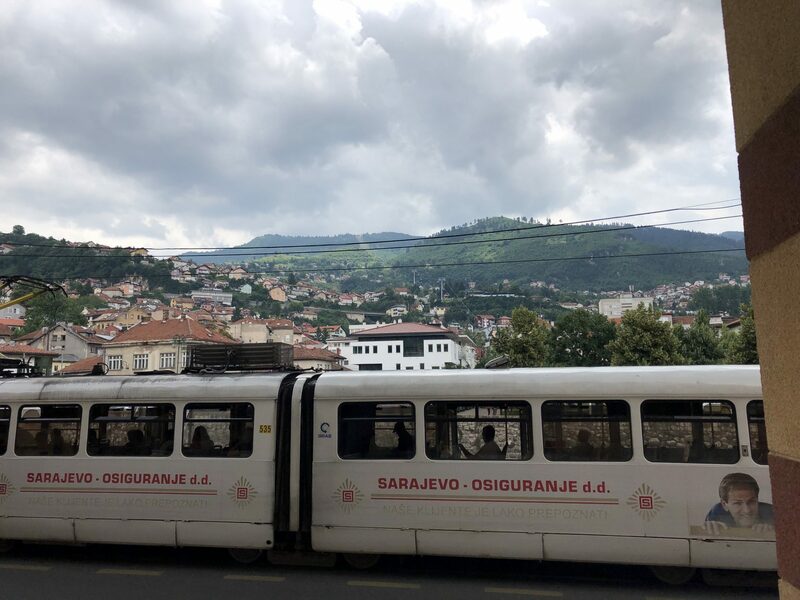 Even after only being there for one day, we could see how different it was from Sarajevo, despite the fact that the two cities were only a few hours’ drive apart. 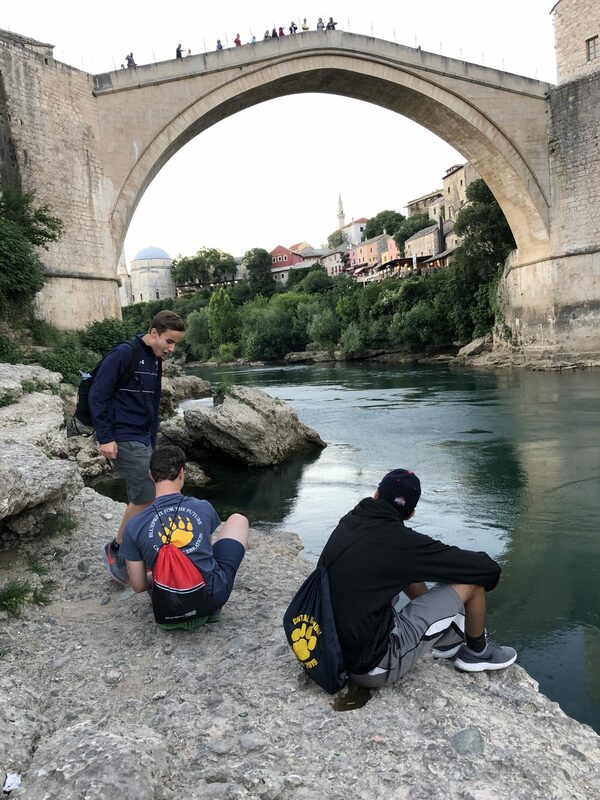 The people, places, and culture changed wildly as we traveled through Bosnia. Our walk led us to a cafe, where we ordered some authentic Bosnian coffee. The coffee is an integral part of Bosnian culture, bringing hundreds of years of tradition together. From the way the beans are ground to how the coffee is poured, the techniques have been refined over the years and resulted in the perfect way to say goodbye to Mostar. After packing up, we all piled in a van and started on our trip to Korčula. Our tour guide from Sarajevo, Taib, came with us to show us the important places that we would pass on our journey. Our first stop was in a town called Stolač. 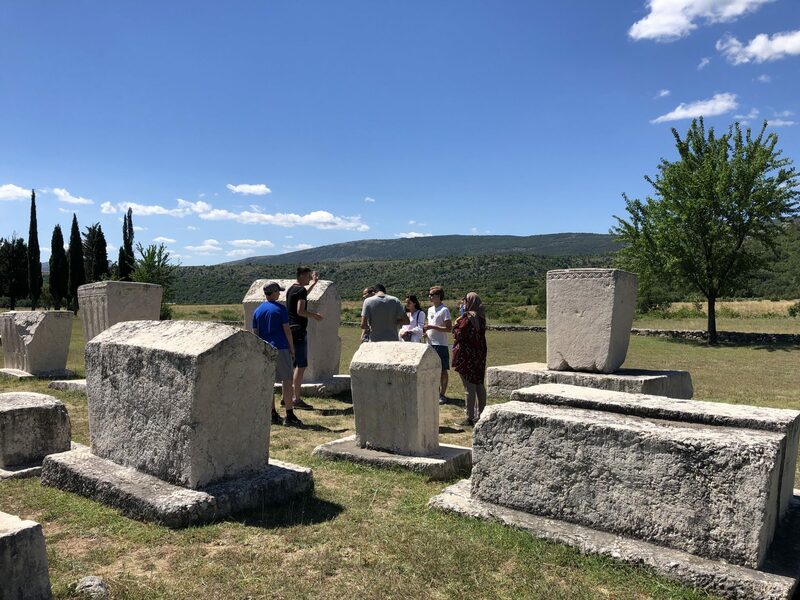 We visited a graveyard that dated back to medieval times, where one of the oldest noble families from Bosnia was buried. Our next stop was for lunch, at a place called “Restauran Han”. As we were waiting for our meal, Taib pointed out to our group a minor detail that we might have missed otherwise, and explained the importance of it. He showed us that the restaurant we were eating at had umbrellas that were advertising a water bottle company that was from Sarajevo, while a restaurant across the street was advertising a Croatian company. He told us that while the difference seemed small, it was actually just one aspect of a feud that had been going on for a hundred years or more. The Muslims in Bosnia are part of a group called the Bosniaks, and the restaurant we were sitting at supported them. The other restaurant supported a group called the Croats, which were Catholics. Although the Croats live within the political borders of Bosnia, they identify as ethnically Croatian. The separation between the Croats and Bosniaks is so strong that many restaurants, schools and even hospitals are segregated, with the religions split apart. Once we were on our way again, we soon crossed the Bosnian-Croatian border, and started to see the landscape changing. The forests started to drop away, giving us glimpses of the beautiful Adriatic Sea, with a backdrop of towering mountains. 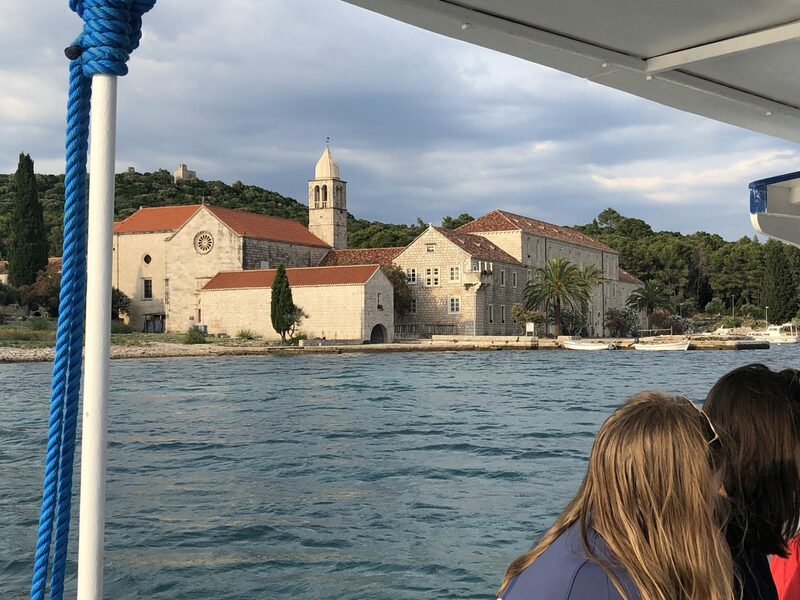 When we arrived at the coast, Adam led us our “water taxi”, which was a motorboat piloted by a Korčula native and his son, who couldn’t have been more than 6 or 7, but looked like he knew what he was doing. On our way to the island, we got an in-depth experience of the Adriatic as it got on our faces and all over our clothes. Fortunately, the sun was more than strong enough to dry us off when we arrived in Korčula. The first thing we did on the island was go to the hotel to drop off our luggage. The bad news that greeted us there was that the hotel was overbooked, and was one room short for us. This turned into good news for us, however, as it meant that Ms. Dunbar, Mason and I got upgraded to rooms in the hotel next door, which was much nicer. (Note: We ended up getting put back in the first hotel anyway. Got my hopes up for nothing!). We dropped off our luggage and went to visit one of Adam’s friends, a man named Frank. Frank and his family had owned a family restaurant for generations, and we enjoyed listening to him talk about the traditions that had started there as we learned how to hand-roll our own macaroni. We ate a delicious dinner there, with locally sourced prosciutto, goat cheese, and one of my favorite Croatian dishes, fried zucchini. After dinner, we had some free time to walk around the town and look through the shops. The boys visited the Marco Polo museum while the girls found some shops selling coral jewelry. After that, we all headed back to the hotel. Tired but excited for our second day in Korčula, we headed up to our rooms for some well needed rest. We started our journey today in Sarajevo bright and early today at 8:00. The boys enjoyed breakfast while the girls enjoyed sleeping through their alarm. Our guide, Taib, took us in a party bus and we drove across the countryside. We saw huge, beautiful mountains as we drove around the base of them. There were so many little villages living at the base of mountains. These villages were so quiet and seemed so far away from any civilizations. It was amazing to see the green and luxurious mountains near Sarajevo gradually transform into rockier, more pointy structures. We took a pit stop at Tito`s bunker. The bunker was huge and was 260m underground. There were many cool sections including one that was full of typewriters to send secret messages. The bunker could hold Tito, generals, and 350 soldiers alive for a year in case of a nuclear attack, which would be a CATastrophe. It was full of heavy metal doors and looked very industrial, although it also looked like the CATacombs because one could easily get lost in this huge underground maze. There were many art exhibits in almost every room of the bunker. The one that stood out the most to everyone was definitely the wardrobe that spun around and sung classical songs. This was to symbolize the nonsense of Tito spending billions of dollars on this bunker that was never used when a nuclear attack might not have been likely. There also was a sign outside the bunker that read, ”we must build a monument to remember our futuristic past”which was very interesting. For lunch we stopped at a restaurant and had unBEEleavably delicious lamb. The view was breathtaking with mountains, rivers, and bridges. We walked around and saw an old train and train tracks that were destroyed by retreating Partisans, led by Tito. After another drive we finally arrived at Mostar. We toured with a woman who raised her family here during the war. She told her story and a lot of history of this area. For example, Mostar literally means bridge keepers, which is fitting because there are so many bridges and they are very famous. We walked around the city and saw a lot of the architecture. 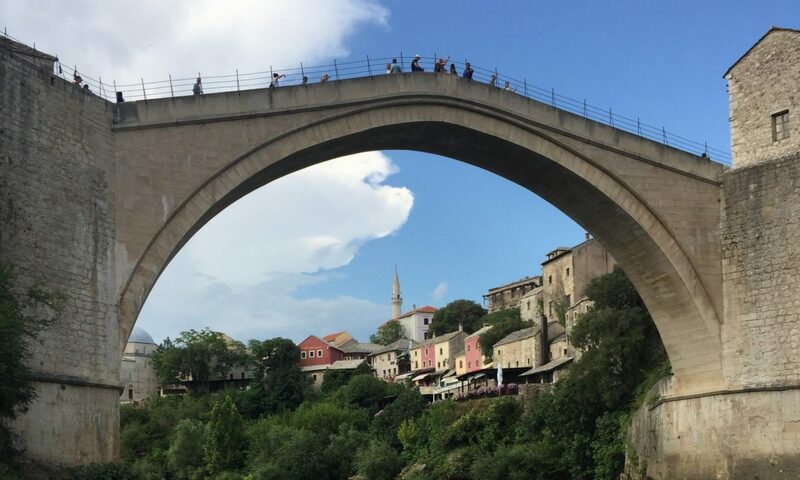 Some significant buildings that saw were, the Mostar bridge, cathedral, minarets, and a giant 70m cross on top of a mountain. On the bridge there were some old guys in Speedos who would jump off if you paid them enough. Finally we came back to the town are shopped for souvenirs and looked around at all the shops. There was a dog who came up to me and he put his head through my hand which was really cute. The teachers were very mean (edit: cautious!) because they didn’t us pet him or any of the other dogs even though he wanted it so badly. We spent some time on the side of the river Neretva after dinner, enjoying the view of the Old Bridge. Dinner was great, we had fish, pasta, beef, and really really good cheese. There were many bee puns at dinner and this was a CATalyst to the whole group becoming good friends. This was the first dinner in which we were all talking and laughing with each other. At dinner there was a bee flying around and Tom ranted about why he doesn’t like bees and different ways to kill them, his most ingenious way was by training the cats that were hanging around the restaurant to eat bees if they got to close, and also saying that they have no reason to bee here, which led to everyone continuously making cat and bee puns. After dinner we made a bee-line to the ice cream stand and then hung out by the river and skipped stones. In conclusion it was a pretty BEEutiful day and I`d say Bosnia is the Bees Knees. I cannot BEElieve we are going to BEE leaving so soon. 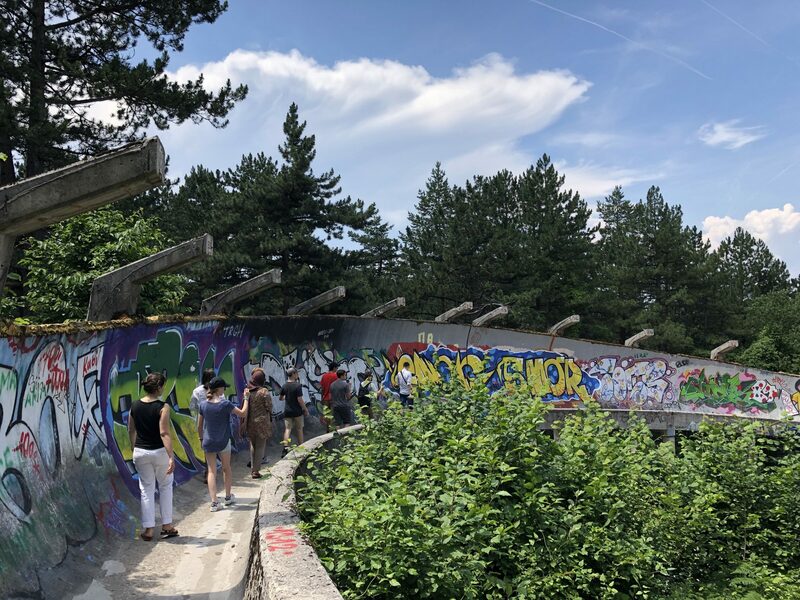 As our last day in Sarajevo, we used today as a reflection and final discussion regarding our experience in Sarajevo and the conclusions to be drawn from our stays in both Croatia and Bosnia so far. The day began with writing and synthesis of ideas in our hotel. 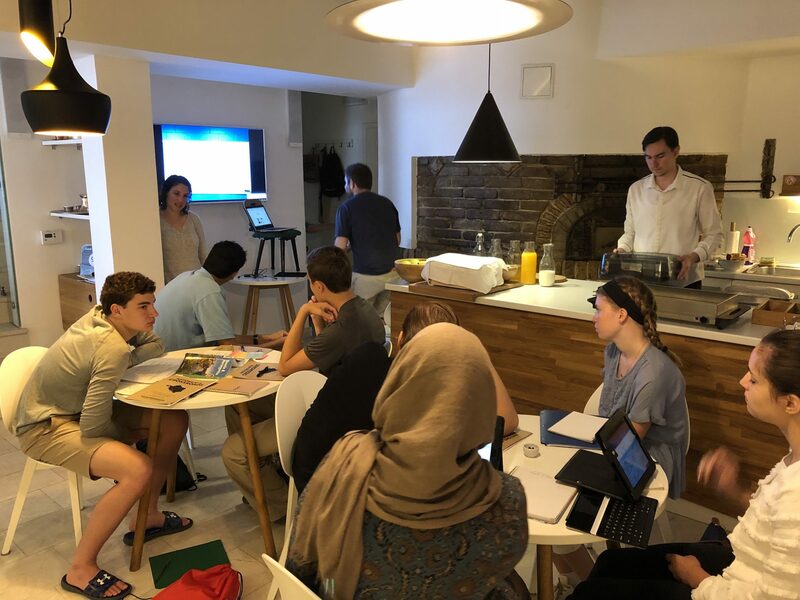 As a group, we discussed the differences in our initial individual ideas of nationalism we began the trip with to our concept of it now, following the evolution and further complexity of our thoughts. Once we identified these changes, we used this thinking to answer a few question on our own in our journals including how Bosnia and Croatian national identity differed and how both countries respectively symbolized and presented their nations. Following individual writing, we came back as a group in which we passed our writings around so that others could read and comment on our thoughts. Reading others perspectives on our learning so far, plus hearing their thoughts about mine allowed me to further grasp and build my understanding of the topics. Ultimately, this collaboration is the most important part of our trip – hearing and learning from others, both in our small group and from people in the countries we visit to form a rich comprehension and respect for the people and places we met, as well as the nationalist topic at the core of our travels. Leaving our hotel, we had a quick walk to the city hall which is used now for galleries and exhibits on Sarajevo’s history. The building is a beautiful burnt red and deep yellow with both prominent stain glassed windows and large chandeliers. 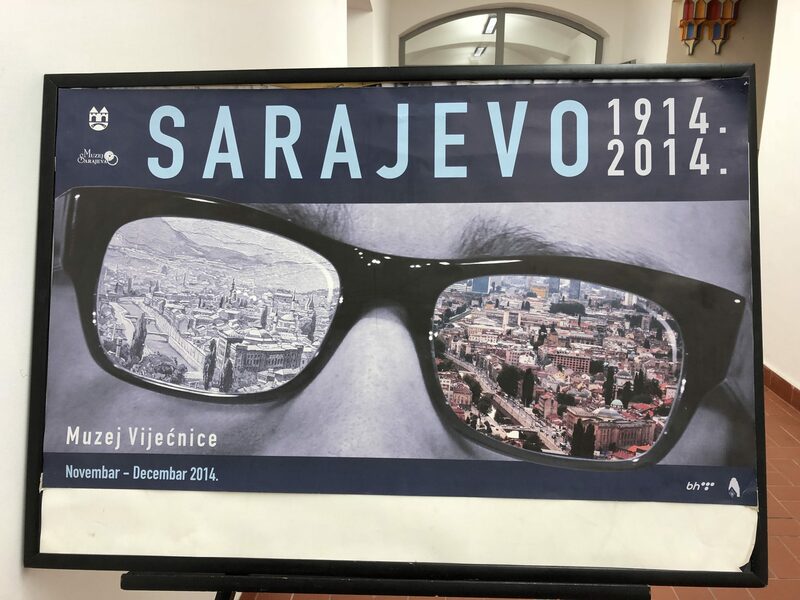 Walking through the exhibit on the history of Sarajevo, I soon noticed the importance of the Olympics, which Sarajevo held in 1984 when it was still a part of Yugoslavia. For this city, it is a symbol of pride and prestige, honor and prosperity. To the people, it is a time in which the world looked upon them and their beautiful city as a place of peace, and eight years before a violent war hit Bosnia. The importance of their time as Olympic hosts expresses the countries desire to find itself in a better place, and ultimately gain that prosperity again after recovering from the war. The city hall exhibit’s focus on this time is a reminder of this desire. There, we met Mak, the president of the United Nations Association in Bosnia and Herzegovina. He took the group to lunch – a restaurant that served various styles of chicken, pasta, etc. Unfortunately, it began to rain as we left the restaurant. With raincoats and umbrellas, we made our way to a Catholic church close by. Our visit here represents the diversity of the city of Sarajevo and its critical role in the identity of the people living here. Within three days in the city, we visited a synagogue, mosque, and Catholic Church a few minutes away from each other. The rich religious diversity and blending of the people presents a country proud of its differences, though with a past that struggled because of them. After Mak spoke to us, we were fortunate to hear from another local, a soldier during the war. Salem gave us insight into his times in the war, the war itself, and his view on Bosnia now. 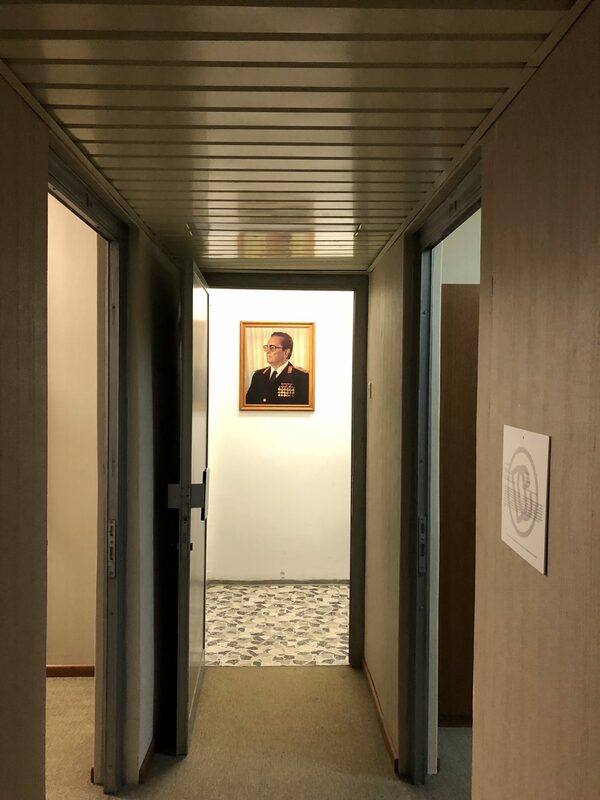 To me, he seemed vastly proud of Bosnia and his identity as a Bosnian, though found the religious and political identifiers used to define the nation as irrelevant to how he approached people and his country. To him, nice, honest people regardless of their religious beliefs and background could be someone he was happy to know. His love for his country showed while our discussion progressed, as he said to us “Without Bosnia I am a refugee. A foreigner everywhere”. In this way, he was proud and content with his Bosnian roots and all that comes with them. 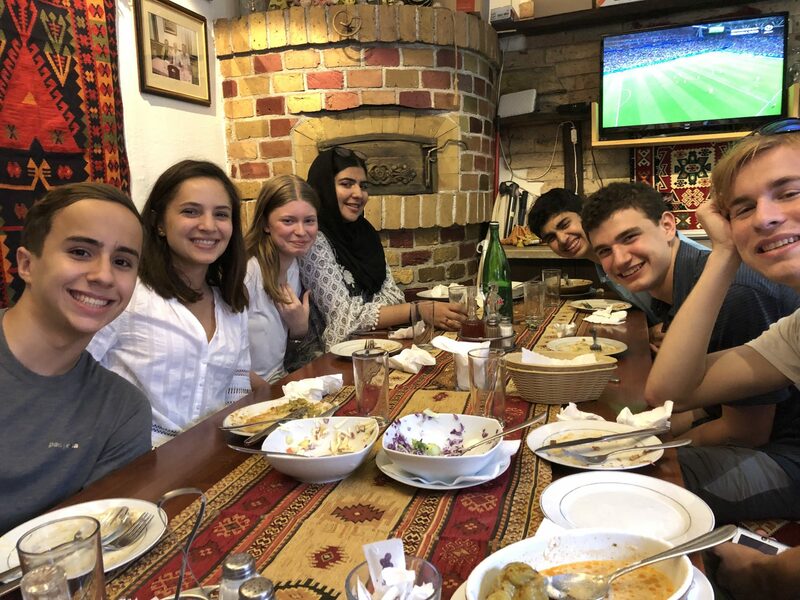 The eye-opening talks with the two locals were followed by free time, in which Iman, Isabella, Dr. Jones, and I explored the city looking for local shops and sweets, while the rest of the group relaxed at the hotel. To conclude our day, the group had dinner in this secluded room of a local restaurant which almost looked to be a former attic of sorts. The Bosnian food, which includes lots of meat, cheeses, and breads as quickly become one of my favorites as I continue to be pleasantly surprised. Ending our day with ice cream, and another walk in the rain, I recall today as an accumulation of the stories we have heard, the people we have met, and the places we have explored so far. We truly have the great privilege of meeting the local people, hearing their stories along with their willingness to talk. Through continuing to dive into the cultures and the complex history of the region, we have gained a far greater understanding of this area. Although we are sad to leave Sarajevo tomorrow, we cannot wait for the next experiences that await! Today we began our first full day in Bosnia. 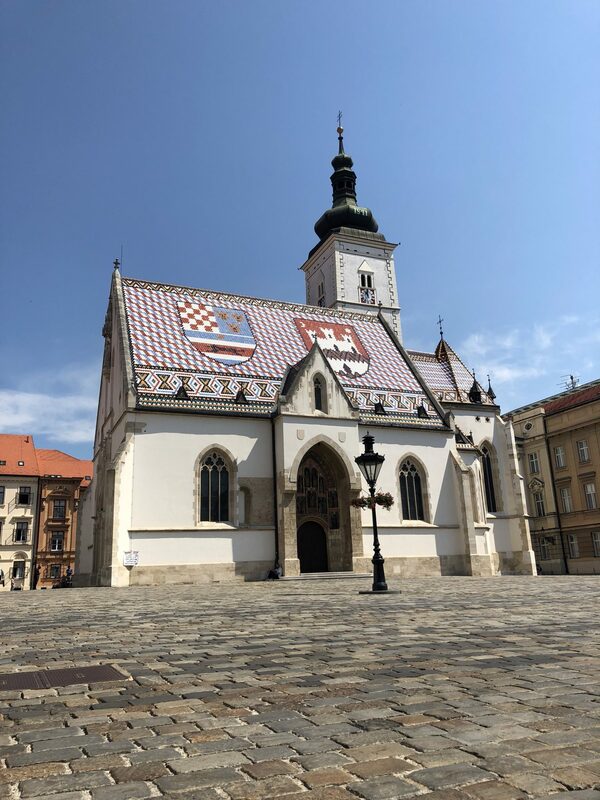 As soon as we stepped outside, it was clear we were in a different country, with tight Turkish corridors and minarets replacing the Austrian boulevards and church steeples that we had become accustomed to in Croatia. This contrast was evident given that our hotel is located in the old Ottoman portion of the city, one of the many sections of a city that has been built by several consecutive and extremely varied governments. We started the day by meeting our guide and taking a short walk through our neighborhood. 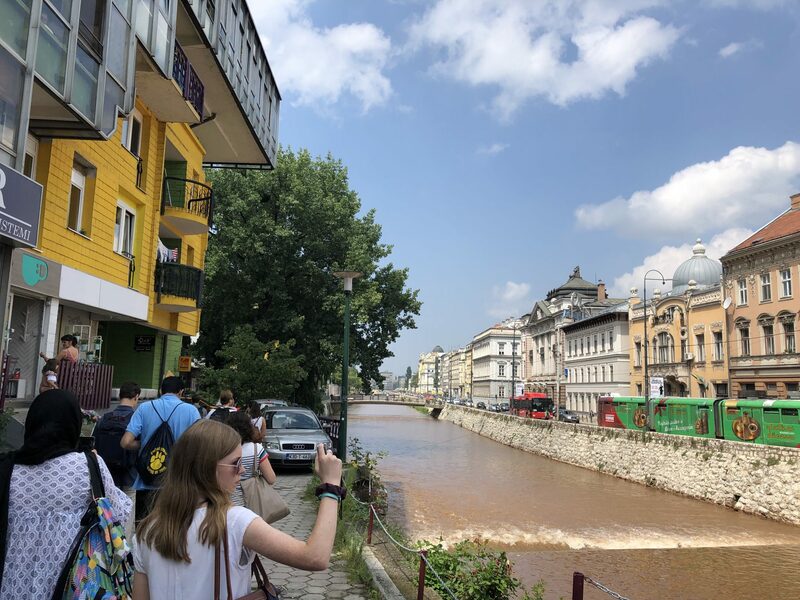 Here we saw the place where Gavrilo Principe pulled the trigger that killed Archduke Franz Ferdinand, the spark that started the First World War. 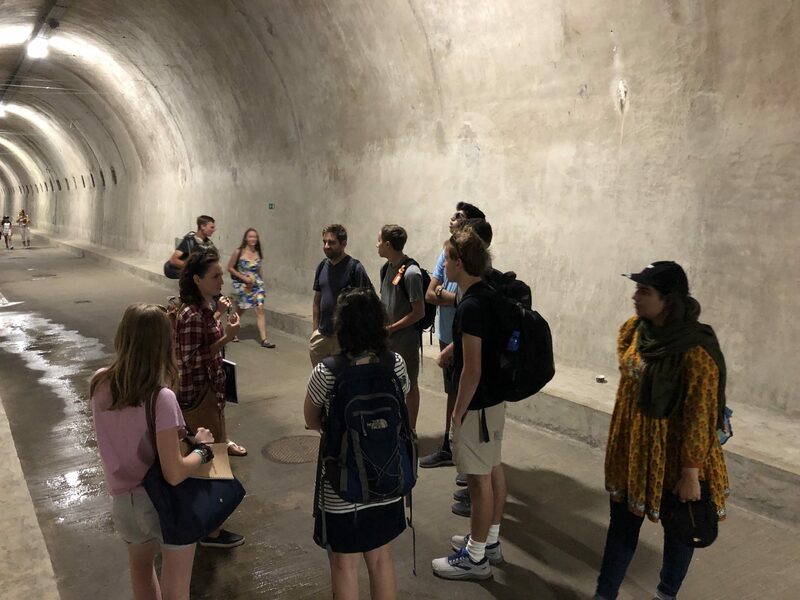 We also learned of the controversy surrounding a nearby bridge, known during Yugoslav times as the Gavrilo Principe Bridge, but now known as The Latin Bridge due to the community near the bridge being heavily Catholic. 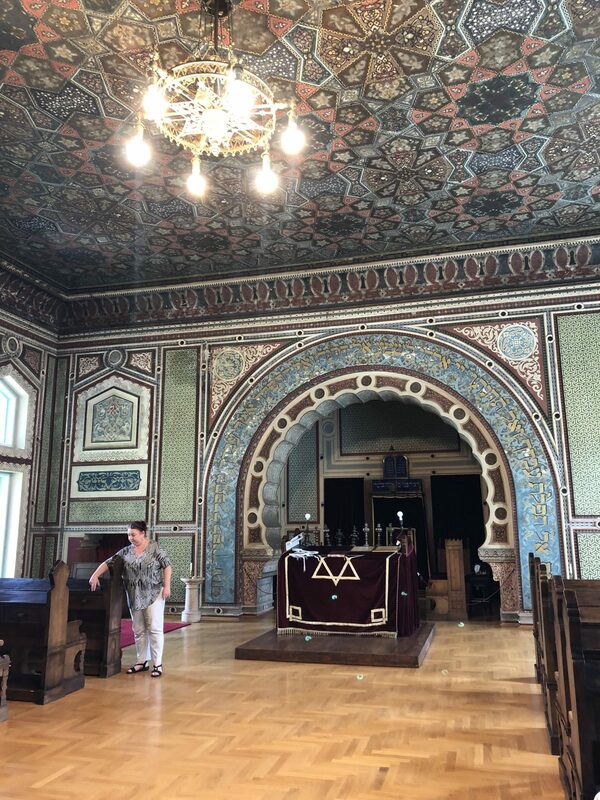 We then crossed the bridge and visited a synagogue, where we spoke to a member of the community who told us about the history and contemporary status of the Jewish community in Sarajevo and Bosnia. The community, once large, was decimated by the Holocaust, but still was vital during the 1990s in providing aid to the besieged city. The Jewish community took a neutral position in the conflict, allowing them to provide aid to the various communities under attack. 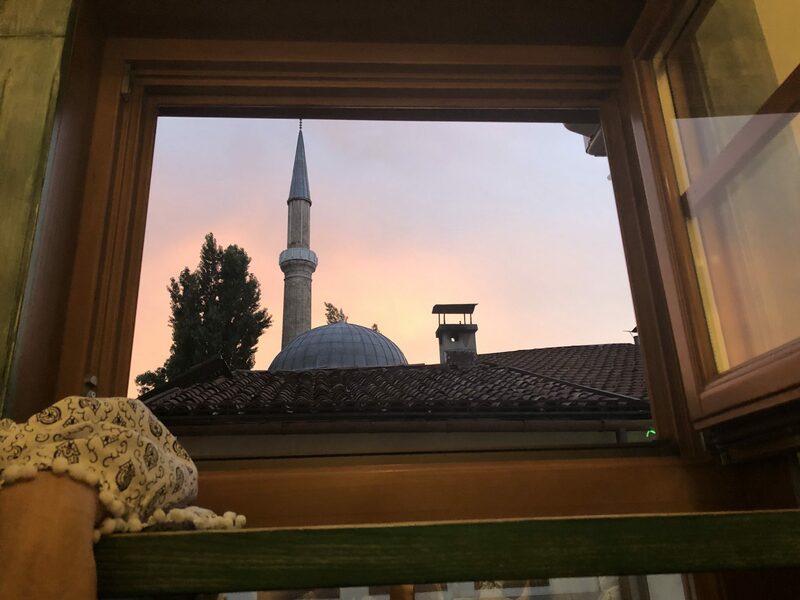 Despite the conflicts of the 20th century, the community feels strongly tied to the nation and hopes to continue to be an integral part of Bosnia’s diverse religious landscape. We spent the afternoon walking the city’s various districts. The city was variously built by Ottomans, Austrians, and Communists, and this is reflected in the architecture of the city and the culture of it’s streets. One part of the culture that all of us enjoyed was the food, especially our lunch, consisting of Bosnian sausages and bread. We all learned a lot on our first day in Sarajevo, and are looking forward to tomorrow! Today can be described in a few words: museums, food, and bittersweet partings. Fortunately for you, I’m going to describe our day in immense detail. Our day started in the same way as the previous one with breakfast at the hotel. I personally adored the coffee as it provided a perfect pick-me-up for me to start the day. We then headed out into the streets of Zagreb, ready to begin the day. Our first stop was to the Memorial Center to the Rocket Attacks, 1991-1995. The museum perfectly captured the feelings of many Croatians during the attacks and displayed newspapers and remnants of the bombings such as the ballet slippers of its injured or dead owner. 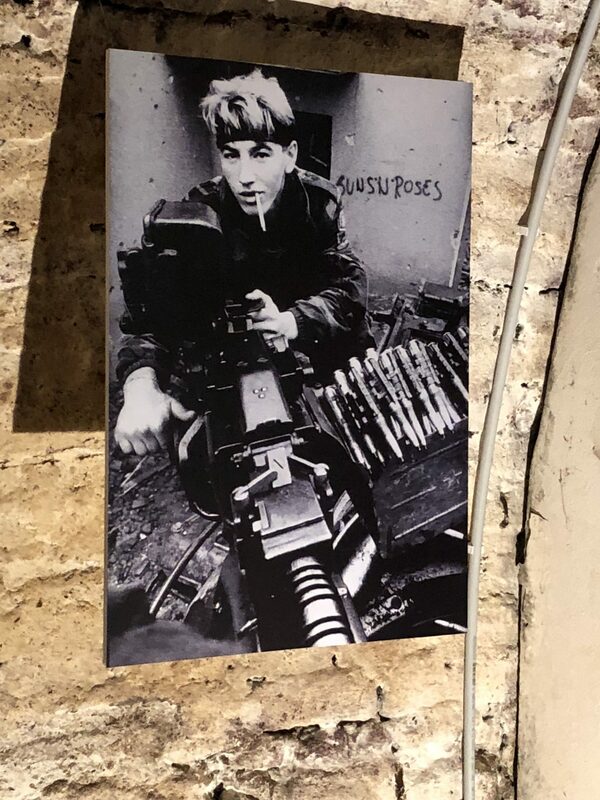 I felt that the museum presented artifacts in such a way that I was able to feel a fraction of what must have been going through many Croatian minds during the War: helplessness, fear, and sadness. We then had the opportunity to speak to the museum guide about his sentiments towards the War and Croatia in general. Although he was reserved in expressing his opinion about the War, he did demonstrate a passionate love for Croatia. For example, he had the opportunity to move abroad to Germany or the U.S. for work; however, he chose to return to Croatia. Our next stop was the local market. We wandered through the market, fully embracing the new scents and sights. I was absolutely lost in the moment and hoped that we would be able to taste some of the juicy red raspberries. Luckily for me, Adam purchased a container of raspberries and a bag of apricots. Though the raspberries were warm, they were even better than they looked. Too bad we can’t bring any back to share. On to the City Museum of Zagreb. As I entered the museum, I expected to zombie-walk through the exhibits and be bored to no end. My experience was the complete opposite. I was enthralled by Zagreb’s history from its ancient days to modern times. I was, however, disappointed by the lack of English signs describing the majority of the museum. My personal highlight of visiting the museum was being able to compare the history of Zagreb to, surprisingly, the history of France. As a result of my love for French history, I could not stop talking to Ms. Dunbar and Dr. Jones about the similarities and differences between historical France and Zagreb. I would include more details about it, but I have to finish this article in the next hour. By the end of the City Museum, it was nearly 3:00 P.M. and the group was starving. Thirty minutes of walking later and we had arrived at lunch: a pizza restaurant hidden from the general public. We ordered our meals (I ordered mushroom pizza with two types of mushrooms and three cheeses) and shared entertaining anecdotes from times at Pingry and in general. The pizza came out and was yet again, amazing. However, the most interesting part of the meal was watching everyone try to eat their pizza with a knife and fork (It was served uncut). To burn off the pizza, we walked to the largest building in Croatia, the cathedral. There, we revisited the beautiful interior of the cathedral. We had approximately twenty minutes to roam around the cathedral and Stepinac’s memorial. Overall, the cathedral proved to be both very calming and picturesque. The next destination was the town center where we had free time to shop and observe Croatian life. We all went our separate ways (but not without a buddy or two) and wandered around urban Zagreb. Meghan and I initially walked up the alley where we searched for gifts to bring back to loved ones at home. (Surprise!) After finding a few trinkets, the two of us walked back to the square to people-watch and explore the shops. Our time in the square expired and the group moved on to our favorite park and food festival. We got our last taste of gelato in Zagreb and enjoyed our cones and cups on the grass. After finishing the gelato, we stayed in the park for a bit to rest and reflect individually on our final day in Zagreb. Soon, we left the park and went back to the hotel to pick up our bags and bid our final goodbyes to Zagreb. We left for the Franjo Tudman airport and watched as the meadows of rural Croatia passed by. We arrived early at the airport and ate together at the outdoor terrace, waiting patiently for our flight to Sarajevo. Finally, we passed through the airport to the gate where some of the boys bought European treats while Meghan, Iman, and I chatted together and waved to an adorable little girl. We boarded our flight, when I started this blog and settled in for what seemed like a fifteen minute flight. Dilan, Mason, and James discussed solving Rubik’s cubes; Tom and Iman fell asleep; Meghan filled in her journal; I finished slightly less than half of this blog (I told you there would be immense detail). Upon landing and entering the airport in Sarajevo, I was struck by the differences between the airport here and in Zagreb. The airport in Zagreb is far newer and cleaner whereas the airport in Sarajevo is more retro and reminded me slightly of the airport in Casablanca, Morocco. Driving to the hotel, I was mainly writing this blog, but I did manage to look out the window for a few minutes. Sarajevo reminds me tremendously of a European version of Morocco and hopefully, I’ll be proven right tomorrow. Checking into the hotel, most of the group seemed chatty but slightly tired. We checked in around midnight (right now, it’s 12:23 A.M.), and we finally went upstairs to our stunning rooms, concluding the day’s adventures. I hope you all enjoy this article, I know Meghan and Iman did. Sarajevo! Checked in to our hotel very late, will post blog from today later.